This is my Hearts A Bursting bush, sometimes known as a strawberry bush. It is showing its fall colors. The seed pods open in the fall and the seeds, usually 3-5 in each cluster resemble M&Ms. The recent rainy weather (Trinity, NC) has made the leaves almost white this year! 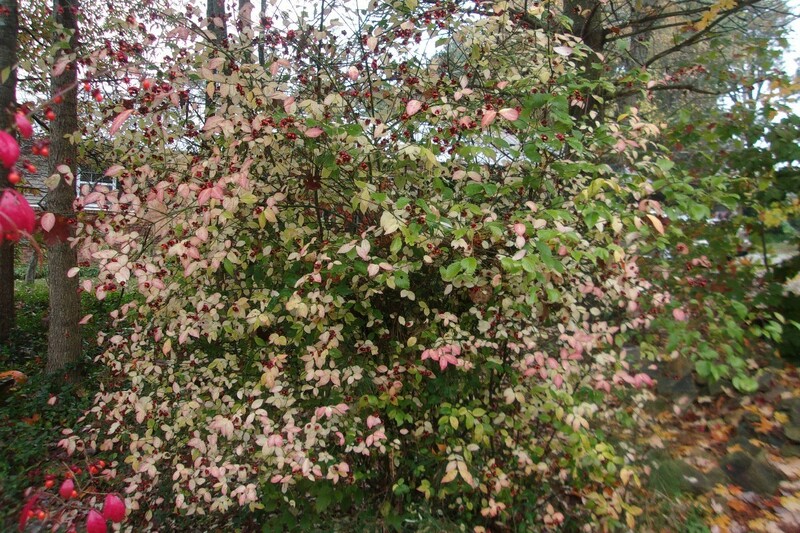 This is a plant that is native to the upper piedmont of North Carolina. I hope to propagate some cuttings from it this year. Photo Description This is my Hearts A Bursting bush, sometimes known as a strawberry bush. It is showing it's fall colors. The seed pods open in the fall and the seeds, usually 3-5 in each cluster resemble M&M's. The recent rainy weather (Trinity, NC) has made the leaves almost white this year! This is a plant that is native to the upper piedmont of North Carolina. I hope to propagate some cuttings from it this year. I wish you luck with your propagation, partly because if you're successful, I hope you will consider sharing a couple plants with me. You should be. 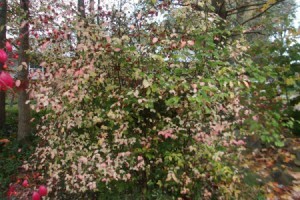 This is Euonymus Americanus. Euonymus' are easy to root. I have around three hundred Euonymus Emerald Gaiety rooted, now. Should you want some, just let me know. I have traipsed through Archdale, Trinity, Thomasville, (Spent childhood Summers on Owen's Farm), and I never saw this bush. It's new to me. I did some research and found that this plant is considered poisonous to humans. You might want to wear gloves while handling it. It seems that the red coloring is a very strong laxative. Because you introduced this plant to me, You get a thumbs up. Thank you for the information Doug! I never saw this shrub around the Trinity area. My ex inlaws live in Northwest Guilford County in Stokesdale, and that is where I dug this up about 30 yr ago. I'd be more than happy to give you some cuttings. I had some rooted a few years ago, just took cuttings and stuck them into an outside planter and they rooted over the winter, however our home was destroyed by a fire and the firemen demolished my planter and trying to save a few cuttings was the least of my worries. But it is a very unusual beautiful plant that I've never seen used in landscaping. I have a few of the Euyonomous burning bushes that I've planted the volunteers that the mother plants have sprouted as well. Thank you for your comments!